In a statement issued in Ado-Ekiti on Monday by his Special Assistant on Public Communications and New Media, Lere Olayinka, the governor said the people of the South South had already demonstrated their approval of Jonathan’s performance while in office by voting overwhelmingly for him on March 28 despite the gang-up orchestrated by Chief Obasanjo and his allies. 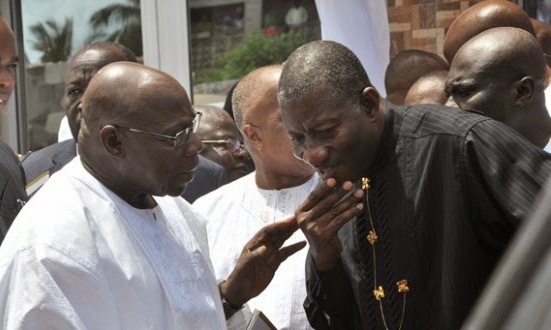 “Most importantly, Jonathan’s performance as a democrat has been widely acknowledged locally and internationally, particularly by President Mohammadu Buhari, who on many occasions acknowledged the role he (Jonathan) played in midwifing a peaceful and successful transition programme, thereby averting the feared crisis in the country. “This is in contrast to Baba Obasanjo, who tried third term when he was about concluding his constitutional two terms. And who knows whether he would have tried fourth term if he had succeeded with his third term agenda? “The reality is, assuming but not conceding that Jonathan performed below expectation, democratic governance that he established in Nigeria is more important than any other performance that Obasanjo alluded to,” the governor said. He said people living in glass houses should avoid throwing stones, adding that Nigerians know those involved in the Halliburton scandal and people who are yet to be cleared of their alleged complicity in a scam like Halliburton lacked moral rights to brand other people as corrupt.